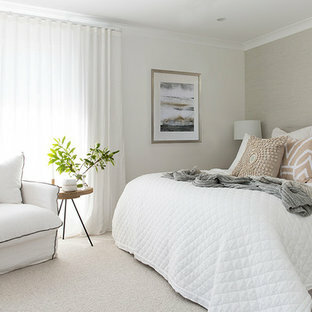 Large beach style master bedroom in Gold Coast - Tweed with white walls, carpet and grey floor. 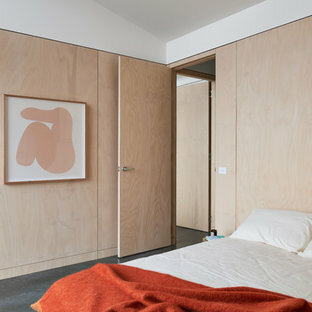 The second bedroom featuring plywood panelling, natural burnished concrete floor and organic cotton bedding, mattress and pillows. Photo by Dan Hocking. This is an example of a mid-sized midcentury guest bedroom in Los Angeles with white walls, carpet, grey floor and no fireplace. 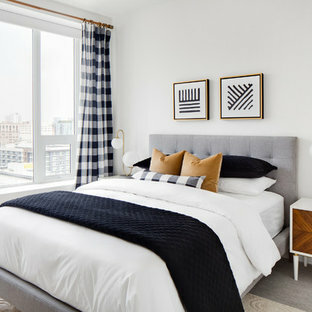 Inspiration for a modern bedroom in Seattle with white walls. Design ideas for a modern bedroom in Other with multi-coloured walls. Scandinavian bedroom in Other with beige walls and medium hardwood floors. Contemporary bedroom in Other with white walls, medium hardwood floors and brown floor. 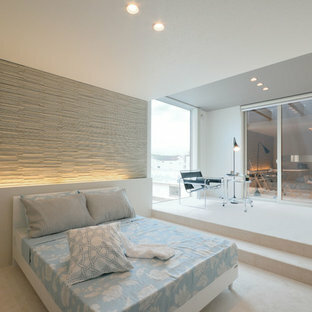 This is an example of a transitional bedroom in Miami with grey walls and carpet. This is an example of a mid-sized contemporary bedroom in Ahmedabad with ceramic floors, beige floor and beige walls. 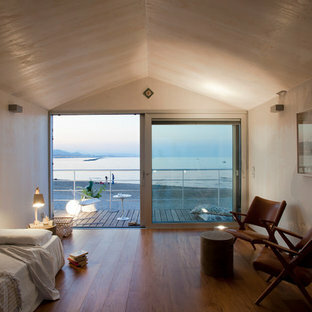 Inspiration for a large scandinavian master bedroom in Munich with white walls, light hardwood floors and no fireplace. This is an example of a midcentury master bedroom in New York with green walls and dark hardwood floors. Photo of a transitional bedroom in New York with grey walls, dark hardwood floors and brown floor. White printed designs from The Window Film Company are the ideal way of adding a stylish design feature to glass and glazing. With a wide range of varied patterns to choose from, there is a product to suit every style and taste. Each panel is created to your exact size specifications, and printed by our in-house graphics department. Industrial loft-style bedroom in San Francisco with beige walls and medium hardwood floors. 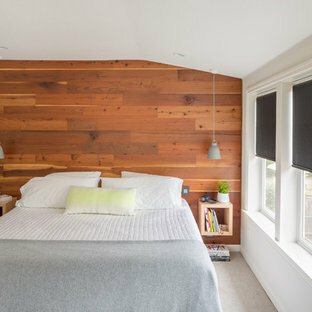 Design ideas for a modern bedroom in Salt Lake City.